Home → Fishing & Boating → Fishing → Fishing Resources → Maine Fishing Guide → To Keep or To Release? To Keep or To Release? A variety of regulations exist regarding the harvest of fish within Maine's water bodies. Before going out on the water, reference the current Maine Open Water and Ice Fishing Laws to confirm your daily bag limit and any other restrictions. 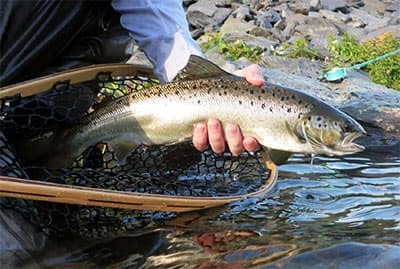 If you're fishing in a catch-and-release-only water body, the decision has been made for you; but otherwise, you can decide which legally harvestable fish to keep for consumption, which to release, and how to conduct either activity. Many fishing regulations are designed to improve fish growth and size quality, and they are only successful if fish are harvested by anglers. A lack of harvest can cause fish to stunt and not grow. Either way, it's your job to bring a humane approach to the table. If you decide to release your catch, the following tips will help result in a successful release. By carefully following these simple instructions, you can release your fish unharmed. If you enjoyed catching your fish, so will the next angler! Time is of the essence. Play and release the fish as quickly and carefully as possible. An exhausted fish may be too weak to recover. Please, do not overplay your fish! Keep the fish in the water. Minimize or eliminate the time your fish is out of the water. As little as 30 seconds of air exposure can cause delayed mortality of released trout, and in the winter months the fish may be subject to a quick freeze. Wet your hands when handling the fish. Dry hands can remove the layer of slime that protects the fish from fungi, bacteria, and parasites. Photograph responsibly. Photo sessions can be stressful for a fish. Prepare for the photo with your fish safely under the water surface, and only lift the fish out of the water for 5 second intervals or less. Try to get the shot (within reason), but return your fish to the water for a rest between attempts. Be gentle. Keep your fingers away from the gills, don't squeeze the fish, and please, never drag a fish onto the bank! Choose the right landing net. Rubber nets are easier on fish than traditional twine nets. Safely remove the hook with small pliers or a similar tool. If the hook is deeply embedded or in a sensitive area such as the gills or stomach, cut the leader close to the snout. Make an effort to use regular steel (bronzed) hooks to promote early disintegration. Avoid the use of stainless or gold-plated hooks. One way to release your fish quickly is to use barbless hooks. If barbed hooks are all you have, you can bend the barbs over or simply file them off. Neutralize the pressure. The air bladders of togue (lake trout) often expand after being pulled up rapidly from deep water. If a togue's belly appears expanded, release it from the hook first, then gently press your thumb along the stomach near the paired belly fins and move it forward a few times to release the air before releasing the fish. Revive the fish. Hold the fish underwater in a swimming position until it can swim away (note: do not use this method if surface water temperatures are unusually warm).